Show you are an avid bowler on and off the lanes with this quirky shirt! 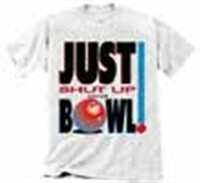 Due to the time it takes to produce the Just Shut Up and Bowl T-Shirt ball it will ship in immediately. We cannot ship this ball outside the United States.